Hybrid analog-digital face with colorful LED-driven displays behind highly-visible jump hands. Includes date display, multiple time zone support, weather information, step counter, stopwatch with lap function, and battery status display, as well as a configurable 24-hour "bug" indicator to mark UTC, TZ, or local time. 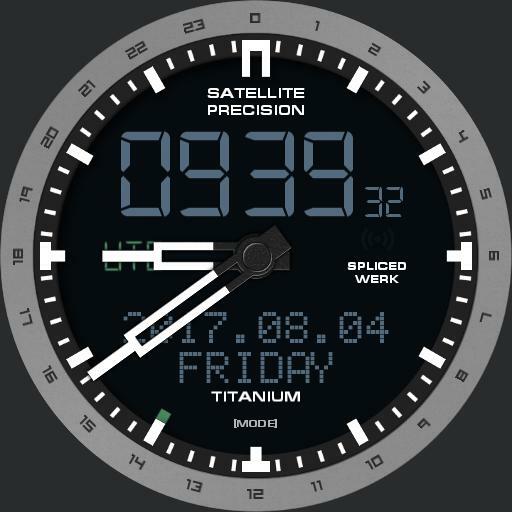 This face supports Watchmakers color picker and offers options for dim mode dimness and marker color/visibility. The timezone indicated by the bug is selected via the digital timezone display UTC, TZ1-3.